A safari jacket or bush jacket is a garment originally designed for the purpose of going on safari in the African bush. When paired with trousers or shorts, it becomes a safari suit. A safari jacket is commonly a lightweight cotton drill or lighter poplin jacket, traditionally khaki in color, with a self-belt, often with epaulette style shoulder straps called passants, with four or more expandable bellows pockets. The earliest reference to a 'safari suit' listed in the The Oxford English Dictionary is from an American newspaper in 1935. In 1936, author and adventurer Ernest Hemingway designed a 'bush jacket' which was made by Willis & Geiger. In 1939, Abercrombie & Fitch advertised safari jackets, shorts and trousers, of 'coat shirt style' for sports and leisure wear. 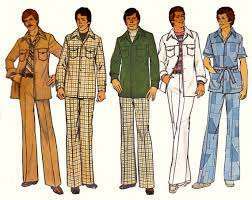 In the 1960s and 1970s safari suits became fashionable thanks to designers versions for men and women by, for example, French designers Ted Lapidus and Yves Saint Laurent, both of whom are among those credited with inventing and popularising the look.